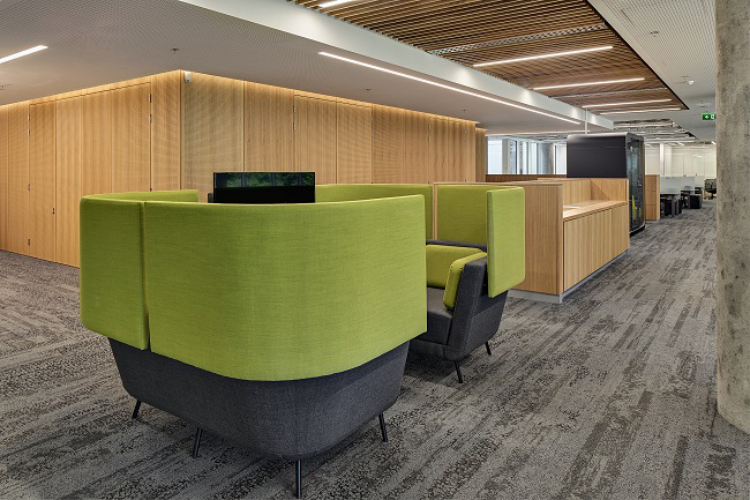 TODD Architects have completed a progressive workplace fit out for CNP Santander Insurance, undertaking the interior planning and configuration of its newly constructed offices at Three Park Place, Hatch Street Upper, Dublin 2. 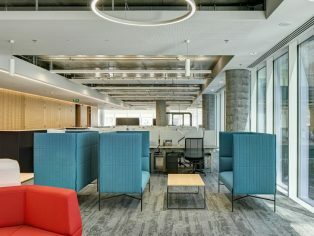 Following an in-depth staff consultation process, TODD Architects created a concept which considered and delivered a consciously ergonomic, contemporary workplace which meets the current needs of the staff, while also allowing for future expansion with the addition of a purpose-built sublet area. Meeting rooms are located to the periphery of the plan with workstations positioned centrally, promoting multidisciplinary interaction between teams. Informal breakout and meeting spaces, including glazed pods, are interspersed for formal and informal meetings and interactions. The plan for the second floor fit-out uses the overhead finishes and varying ceiling heights to define space, while maintaining a unified free flowing open-plan office layout. 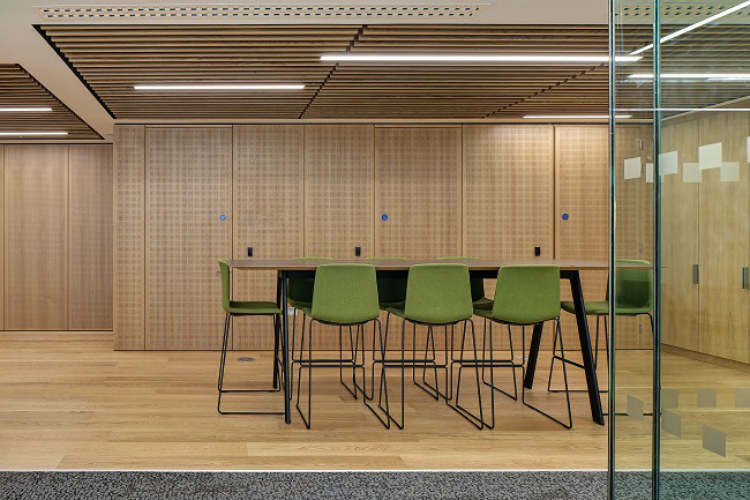 Acoustic considerations are addressed using suspended acoustic ceiling panels clad in perforated oak veneer acoustic timber panelling. These also create a clean, aesthetic finish in concealing the large overhead ventilation ducts as well as providing a mount for other ceiling services such as the fire detectors, voice evacuation speakers and sprinkler heads. 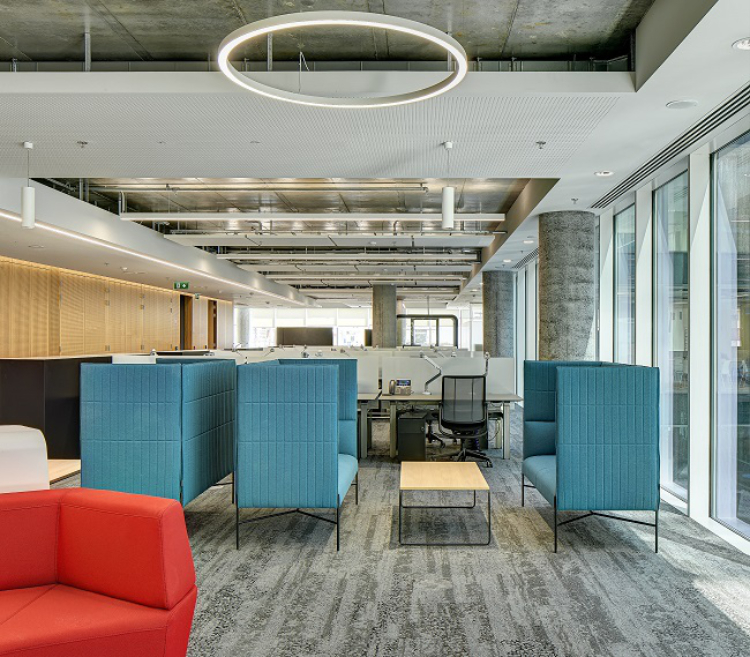 The material palette and specified furniture were key components in the workspace design. All task chairs were pre-tested by employees to find the right fit for each specific need, with all workstations also offering the flexibility of electronic sit-stand. 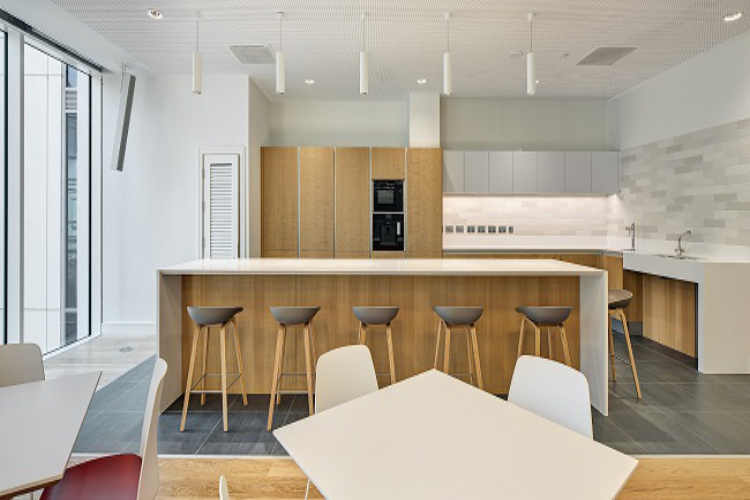 The kitchenette and canteen offer employees essential facilities and an open plan social dining space which can also be used for formal and informal meetings. It is currently facilitating townhall forums. Completed in June 2018, the scheme has already received an overwhelmingly positive response and was shortlisted in 2018 Fit Out Awards.